Removing the lower spray arm in a Hotpoint dishwasher can appear difficult on first glance. In the majority of dishwashers, the lower spray arm is held in place by a series of washers and screws. However, this isn't the case in Hotpoint dishwashers. The lower spray arms in these dishwashers clip into place and can be removed by simply gripping and lifting up on the piece. This can be confusing, because it is a little different from the norm, but there actually isn't any special trick to it. Turn off the power to the Hotpoint dishwasher, either by shutting off the power switch located in the wall near the dishwasher or by shutting off the fuse that controls the dishwasher's electrical feed. This is very important to ensure that no injuries occur while removing the spray arm. Open the dishwasher and unload any dishes that may be inside it. Remove the lower dish rack from the dishwasher. Grip the lower spray arm of the dishwasher with both hands, one on either side of the pivot point. Pull straight upward. 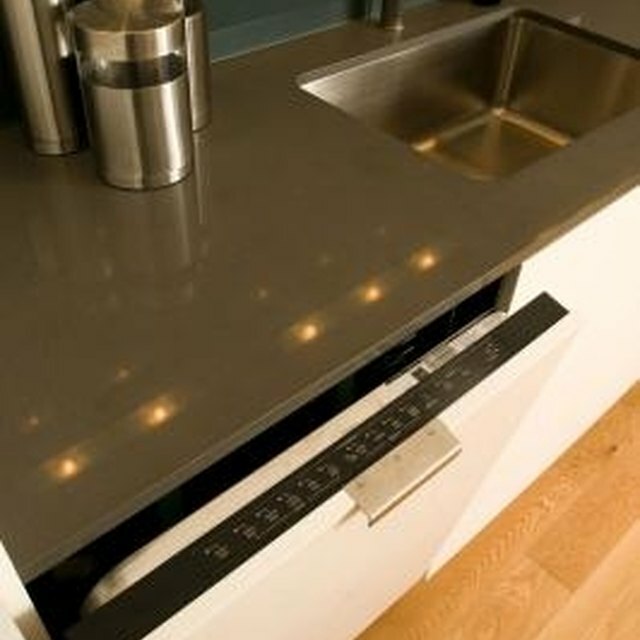 Be careful not to exert too much force, as that could cause injury or break the dishwasher. If the spray arm doesn't easily unclip from its position, jiggle it a bit until it loosens. If you are removing the spray arm to clean the dishwasher, scrub the arm down with mild soap and warm water, rinse thoroughly and replace.